Scientific researcher Doctor Winston is genetically modifying turtles in hopes that one day they will help humans learn to fly. 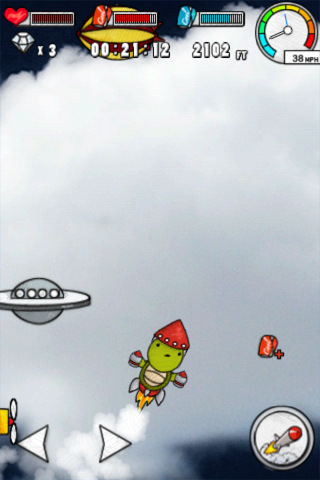 Join him on his race to the clouds with the new (and temporarily free) Turtlefly, but prepared because this game is addictive. Launch TurtleFly for the first time and the app sends you straight into the action with a seven level quest to conquer a series of flight achievements through trial and error testing. 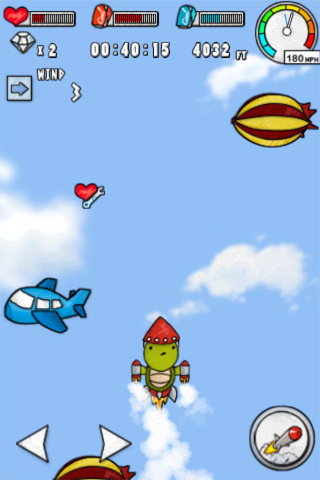 Send the turtle catapulting into the air by holding the jet button and use the left right buttons on the bottom of the iPhone screen to help your turtle navigate through the air. The first few flights are shaky and almost impossible to control, but as you learn to acquire health and fuel power ups while crossing the path of diamonds you earn money. At the end of each level these earnings give you the power to make changes in the turtle’s flight by purchasing strategic upgrades in the TurtleFly shop. Initially the purchased upgrades reflect their low cost, but as you move up from one incremental improvement to the next, features like speed, controls, wind resistance, and fuel capacity all make flying easier and more exciting. What starts with flights that only last seconds quickly becomes a race to achieve level markers like “flying for a minute without hitting any obstacles” or “fly or a minute and a half.” Each of these achievements goes toward letting our jet powered turtle move onward from one test flight to the next, all the while keeping fuel levels up as long as possible, avoiding death by collision with upgrades, and much more. The developers J2Sighte deliver seven levels in all with a whole lot of gameplay and challenges to conquer. The animations themselves are sketch-like and adorable, but there isn’t a ton of variety in the landscape from one day of flight testing to the next. The soundtrack is also excellent, but because this is a game you’ll want to play for hours on end, the song effects all start to sound the same. The only other slight inconvenience in Turtlefly is in the constant presence of the shop. The game puts a lot of inherent emphasis on upgrades (which is great), but sometimes when you’re saving for a big jetpack upgrade you just want to keep playing instead of going back to the store between every flight. Endure that small flaw and everything else about Turtlefly is wonderfully addictive. The game does a great job of keeping you just far enough away from the next achievement for just long enough, and then the smell of victory keeps your turtle jetting off into the blue sky higher and higher. 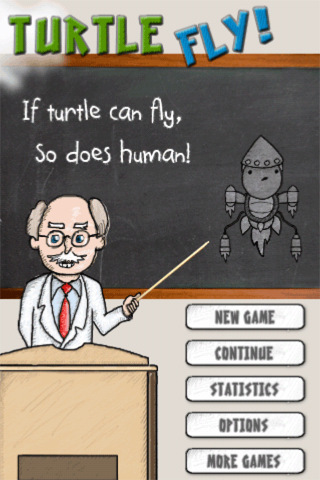 Bottom Line: TurtleFly for iPhone is an addictive and lighthearted flying game with a nice story and great power upgrades. If you’ve conquered every level in Angry Birds this could be your next obsession.